Last weekend was the first Fan ExpoVancouver ever, aka Vancouver Comic Con, where fans of comic books/super heroes/Star Wars/Star Trek and anime convene! Hobby Star Marketing is the Toronto event group that created Fan Expo Canada (Toronto Comic Con), starting in Toronto and moving its way across the country, taking Fan Expo to Calgary and Vancouver this year. This year’s Fan Expo Vancouver was held at the Vancouver Convention Centre and cost $30 for a 2-day pass (or $20 for a 1-day pass)held over Saturday and Sunday (10am – 7pm). 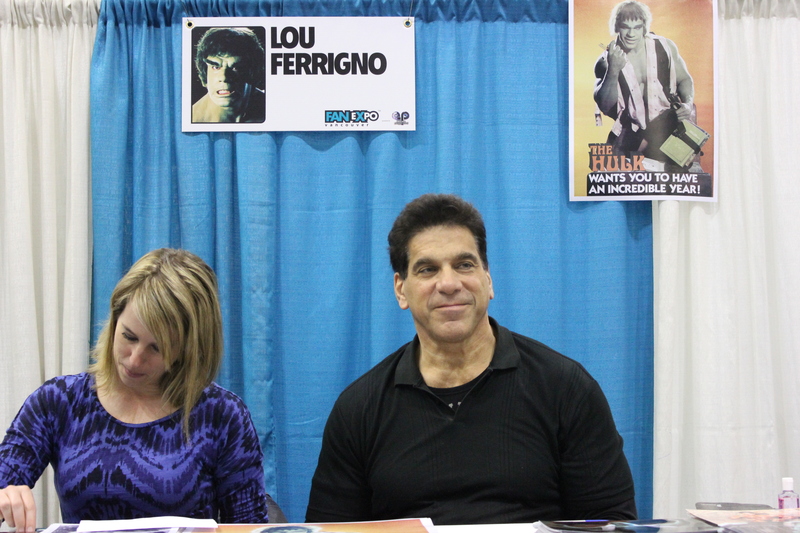 What first caught my attention to Fan Expo Vancouver was the special celebrity guests. Adam West (the 1960s Batman), Burt Ward (the 1960s Robin), Kevin Sorbo (Hercules), Alan Ruck (Cameron from Ferris Bueller’s Day Off), Lou Ferrigno (The Hulk), Nicholas Brendan (Xander from Buffy The Vampire Slayer), Michael Dorn (Worf from Star Trek TNG) and more! Then Toronto and Calgary both confirmed more Star Trek TNG guests and Stan Lee, so I was deeply hoping that they would come to Vancouver as well. Although Will Wheaton, Brent Spiner, etc. didn’t make it, and neither did Stan Lee, I was still happy with this year’s lineup. My first day on Saturday included a huge line-up inside the new Convention Centre from upstairs to downstairs, approximately 45min minimum wait to go in and pick up our 2-day wristbands. However, a lineup was forming outside for those without pre-purchased tickets, probably so the organizers can process all the pre-purchased ticketholders first before selling additional tickets. However, it would’ve been smart for them to form the lineup inside as no one outside knew what was going on and how long the wait would be. Saturday was the day when the die-hards came in costume. We saw at least 30-40% of people in costumes! Everything from Japanese anime like Goku from Dragonball Z, to Snow from Game of Thrones. Groups came as the Avengers or X-Men characters, while others wore cartoon and comic paraphernalia. Aside from all the cosplay costumes, we were in awe at all the vendors, especially those selling items we weren’t aware of existed like Italian Stallion (Rocky) robes and Thundercat themed hockey jerseys. We then chased down R2D2 and took a pic of him as he roamed around, ending up spending some time checking out the 1960s Batmobile from the original Batman TV show. The only gripe was the cost to take photos or autographs with the stars. Photos started at $30 up to $100 and same with autographs. The main line ups I saw were for Kevin Sorbo (female fans obviously), and for Adam West and Burt Ward. The other lineups were quite quiet and I managed to get a few pictures of the stars at their booths. I also sat in on a few Q&A sessions on Saturday & Sunday. 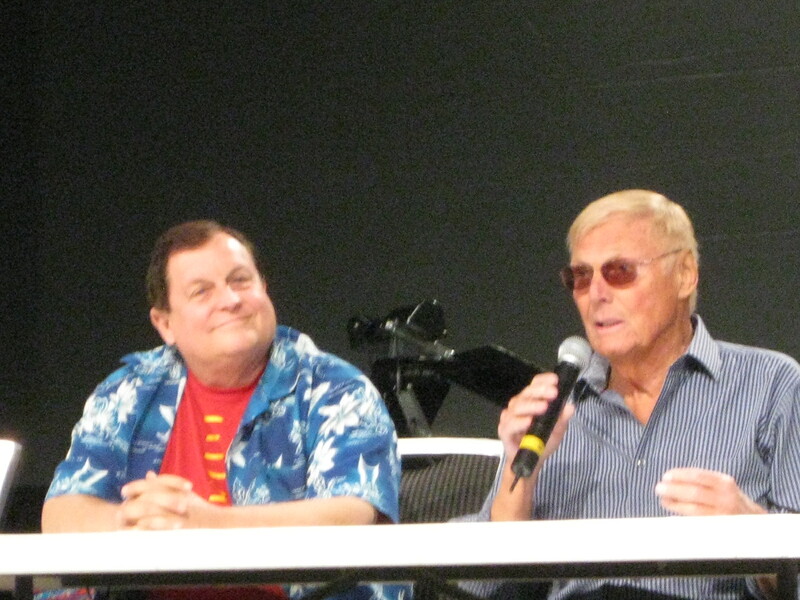 Saturday so I sat through Nicholas Brendon (Buffy The Vampire Slayer’s Xander) and the Q&A for Adam West/Burt Ward. Both were highly interesting and funny at times by the questions the fanboys and fangirls were asking. On Sunday I sat in on the Marina Sirtis and Michael Dorn’s Q&A, which was also just as funny and entertaining. We also managed to sit in on a Sketch-Duel session with 3 talented comic artists (Stephen Sadowsky, Georges Jeanty, and Mike Choi). My take on the session was – amazing talented artists, poor organization/format of the actual Sketch-Duel event. I was expecting the 3 to be sketching the same drawing and seeing which one did better. However, they all drew different items and turned it more into a Q&A session. However, the event did allow me to see how talented these artists are! On Sunday, I went back and purchased a sketch drawn by Mike Choi. Easier way to process pre-purchased tickets (opening Box Office earlier in the morning the day of the event and the night/day before the event) – what’s the point in pre-purchasing advance tickets if we have to lineup the day of as well?! The lineups also caused us to miss the starting workshop we had wanted to go to. More signage around to let people know what’s going on where. Would have been neat to have costume contests or something so we can see more effort from people willing to cosplay on both days, not just on the Saturday.